although i’m cetainly a video game buff, i’m not a “collector” for the sake of collecting; i’m a collector only in terms of wanting to play original games in their original configuration (i.e. with the original hardware and peripherals, although sadly with arcade games i have to make do with the nearest console version). this has led me to some relatively expensive purchases, but nothing too extreme. given the mountain of great games i haven’t played, there isn’t too much need to really dive too deep into the realm of obscure but worthwhile but also pricey games. nevertheless, i find video game collecting for the sake of collecting to be interesting. racketboy has a feature on “the holy grails of console gaming” that’s an interesting read. but the reason i’m mentioning all this now is that the guy who runs the essential videogamepricecharts.com (how did we ever live without it? 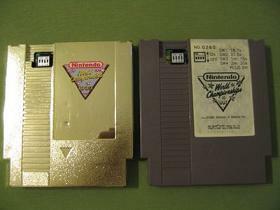 ), posted this week about his epic saga on acquiring the holy grail of console gaming, the nintendo world championships gold cartridge. it’s a great read (you’ll laugh! you’ll cry! ), and here’s a hearty congratulations to the guy at VGPC for accomplishing what many people can only dream of.